Steampro Carpet Cleaning strives to be the best Carpet Cleaning Company in the Springfield, MO area. We offer the areas our most honest prices and cleaning service, Steampro uses a 7 Step Carpet Cleaning Process, including the Hot Water Extraction method (Steam Cleaning) which is the method recommended by all the carpet manufactures to have carpets professional cleaned. Our new clients are constantly telling us that we cleaned their carpet for around half of what other carpet cleaning companies charged them, and have cleaned their carpets even better, without all the bait-switch tactics the other carpet cleaning companies try to pressure them into. 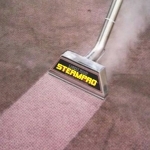 Steampro cleans the carpet in the average single story home for around $100, not $250 or more. A two story or walk-out basement home for around $200 not $350-600. We do not believe in a basic cleaning, in our cleaning process, we include all the necessary steps needed to properly clean your carpet. We can most often schedule your carpet cleaning within 2-3 days and sometimes even the same day, not 2-3 weeks down the road. We may not have any funny commercials or cleaned up after any Alpacas like those guys on television have, but we sure have cleaned thousands of Springfield homes and businesses that had their share of spots, spills, and stains left behind by kids, cats and dogs! At STEAMPRO, we only use the steam cleaning method also commonly known as (Hot Water Extraction). This is the #1 carpet cleaning method the major carpet manufactures recommend, we do not use any phony methods that use little bubbles that come in soft drinks or fast dry, dry cleaning marketing gimmicks. For all your Carpet Cleaning needs in Springfield Missouri you need to call us. We use only van-mounted equipment designed for residential and commercial cleaning. STEAMPRO’S cleaning systems are superior to most other carpet cleaning companies in Springfield MO due to our’s being the latest high-performance, HydraMaster carpet cleaning equipment used in the Springfield area. We also use the best and safest carpet cleaning solutions and special tools to insure the most professional cleaning in the industry, with that our technicians can remove most stains like they never where there. Our machines heat the purified water up to 250 degrees and can be adjusted, combined with the technicians skill, the best chemicals, and experience to treat your carpeting and special fabrics. Our machines also have greater suction power to extract over 98% of the steam and lift stains away to our truck. We actually take the dirt and stains away with us, not smear them into the padding or mask them with “make-up” like dry cleaning chemicals. With great technology and superior cleaning technicians, we always do our best to insure the greatest carpet cleaning experience in Springfield! STEAMPRO Carpet Cleaning Springfield MO has become the most trusted, locally owned carpet cleaning company in Springfield Missouri and surrounding areas for value and customer satisfaction. Our Carpet cleaning service area includes Springfield and surrounding areas such as Nixa, Republic, Ozark, Rogersville, Battlefield, Billings, Willard and other nearby towns. We also clean Tile and Grout, and Emergency Flood Water Extraction!